ABB, the power and automation technology group, has introduced YuMi, the world’s first truly collaborative dual-arm industrial robot, at Hannover Messe. “The new era of robotic coworkers is here and an integral part of our Next Level strategy,” said ABB chief executive Ulrich Spiesshofer. “YuMi makes collaboration between humans and robots a reality. It is the result of years of research and development, and will change the way humans and robots interact. In 1974, ABB introduced the world’s first microprocessor controlled, all-electric industrial robot and kick-started the modern robotics revolution. 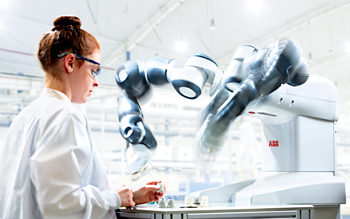 ABB now has an installed base of more than 250,000 robots worldwide. Few production arenas are changing as quickly as small parts assembly. The electronics industry, in particular, has seen demand for products skyrocket past the supply of skilled labour. BCG Research predicts that by 2025, adoption of advanced robots will boost productivity by up to 30 per cent in many industries and lower total labour costs by 18 per cent or more in countries such as South Korea, China, the US, Japan, and Germany. While YuMi was specifically designed to meet the flexible and agile production needs of the consumer electronics industry, it has equal application in any small parts assembly environment thanks to its dual arms, flexible hands, universal parts feeding system, camera-based part location, lead-through programming, and state-of-the-art precise motion control. YuMi can operate in very close collaboration with humans thanks to its inherently safe design. It has a lightweight yet rigid magnesium skeleton covered with a floating plastic casing wrapped in soft padding to absorb impacts. If YuMi senses an unexpected impact, such as a collision with a coworker, it can pause its motion within milliseconds.